After almost a decade of multiple postponements stalling the national political process and depriving citizens of their right to vote, Lebanese parliamentary elections will be held next month under a new legal framework. Passed in June 2017, the new election law replaces the majoritarian system with multi-member proportional representation dividing Lebanon among 15 districts whereby voters can cast their votes for both a list competing in their district and a candidate from the list in their subdistrict. A list of electoral law reforms including out-of-country voting, pre-printed ballots to reduce potential for vote-buying, and proportional representation theoretically upping independents’ chance of success are touted by political elites as reformist steps forward as they maneuver to maintain Lebanon’s stability amid years of unprecedented regional turbulence. Through further promises to fight corruption, unemployment, and to finally deliver on basic services, elites are signalling to national and international observers that they are turning a new page. But barring some exceptions, its business as usual. Reports of alleged vote buying, improper use of ministerial posts for electoral purposes, campaign finance violations, and charges of bribery mount. The electoral commission body overseeing elections is felt by some to lack impartiality and independence and the power to enforce penalties of violations directly. Even the new electoral law is, in essence, a law created for and by the traditional political elite. Plans unveiled at recent international donor conferences are unlikely to come to fruition without genuine structural reforms. And elites aren’t interested. Even with the erosion of March 8 and 14 political blocs and shifting political alliances, traditional elites remain in agreement- maintain the system that keeps them in power and benefitting from its spoils. Efforts to safeguard the status quo while attempting to appear to meet voters’ demands is perhaps no more apparent than in the example of the interplay between politicians and constituents of marginalized (yet not uncoincidentally electoral contested) communities pushing for the passage of a general amnesty law ahead of the elections. A closer analysis provides a lense from which to more broadly understand elites’ manoeuvring to maintain electoral power while paying lip service to marginalized communities they continually fail to serve. Reporting on the general amnesty draft law has mostly been confined to the local press. As background, the first draft law was proposed by Justice Minister Salim Jean Jreissati approximately 8 months ago. A more recent draft was reportedly circulated amongst ministers last month. Although the draft has not been made public, rendering its exact content unknown, Lebanese rights organization Legal Agenda detailed the draft law’s supposed content in an article last month. Legal Agenda reported at the time that the draft law amnesties Lebanese, Palestinian, and foreigners of all misdemeanors with the exception of “violations related to construction, consumer protection, [theft of] antiquities, and corruption.” Amnesty for criminal offenses is reportedly more complicated but in short, may include the following: those sentenced or awaiting trial on drug charges including taking and ‘offering drugs’ but excludes those ‘facilitating,’ growing, or selling drugs (mostly Shia fugitives and detainees from Baalbek and Hermel); for membership in an armed group but not those facing or convicted on charges for killing or trying to kill others, including members of the Lebanese Armed Forces (mostly Islamist fugitive and detainees from Tripoli, the North, and Saida); and for some former Christian members (and their family members) of the Southern Lebanese Army (SLA) who fled abroad. (This article will focus mostly on the Sunni and Shia communities calling for the general amnesty due to their greater public engagement on these issues among other reasons). Rumors over the draft’s current form and likelihood it will pass, if at all, vary daily. Seeking to secure votes in contested districts ahead of elections, namely in Sunni majority areas in the North and South and Shia majority areas of Baalbek and Hermel to the east, representatives from major political parties including Sunni Future Movement and Shia Hezbollah have come out in public support of the amnesty. Some promise it will pass soon. After years of instability, voters are now increasingly focusing on bread and butter issues and elites’ failure to deliver. Voters’ discontent with the government’s performance since the last parliamentary elections in 2009 means elites have little to show to convince voters to give them their vote- instead they are filling the void by busying marginalized communities with promises of a general amnesty. But last month’s reports that the general amnesty may exclude significant numbers of fugitives and detainees fueled further discontent. For more than a year detainees’ families have organized along sectarian lines arranging sit-ins, protests, and closing roads with burning tires demanding that the amnesty be passed. Most vow to continue until the amnesty is passed. Despite the fractured nature of advocacy along mostly sectarian lines, in separate interviews, more than twenty lawyers, activists, and detainees’ family members from these two communities expressed agreement- their respective communities deserve justice and the general amnesty is the only way to get it. To them, the provision of justice is just one more service the government fails to provide. Ongoing delays on electricity, corruption, and waste disposal reforms fail to give needed credibility to Lebanon’s political elites. Adding to the injustice are realities of economic marginalization. Some Sunni communities in Tripoli and Akkar suffer from high rates of unemployment and low levels of development, despite some of Lebanon’s wealthiest elites calling this area home. Residents in Baalbek and Hermel also complain of high levels of unemployment and underdevelopment. Some residents attribute it to the government’s failure to provide them with an alternative source of income and livelihoods after drug cultivation was outlawed in the 1990s. In fact, it’s exactly these hollow track records of success that candidates are trying to fill with promises of a general amnesty. And this solution is one which doesn’t chip away at their place in the system the way anti-corruption reforms may. With little else to concede to voters, they don’t have much to exchange for votes. Candidates from contested districts therefore frequently express support for the passage of an amnesty law during speeches, campaign events and even televised political debates. Some interviewees also alleged that candidates or their supporters made home visits to undecided voters in their area, attempting to secure their votes with the promise of passing the amnesty. In predominately Sunni areas in the north and south, Future Movement MPs frequently endorse the amnesty with some promising that it will pass soon. Future Movement MP Bahia Hariri, who is facing tough electoral competition in the southern city of Saida, told family members of Islamist detainees last month that she is optimistic that the amnesty will include at least some Islamists arrested after the 2013 clashes. The electoral stakes in these communities are high. In the draft law described by Legal Agenda last month, between the Sunni, Shia, and Christians, up to 70,000 people with criminal files could benefit, including more than 30,000 people in Baalbek and Hermel alone. Legal Agenda estimated this to be approximately one fourth of the voters in the area. Adding to their grievances, many have been arrested or are wanted on the basis of “contact documents,” or anonymous civilian reports to intelligence bodies claiming that someone is causing security threats. Although a unanimous decision by the Council of Ministers cancelled the contact documents in 2014, security forces continue to carry out arrests on this basis. Contact documents never followed any judicial procedure, allegedly violating the personal freedoms of the pursued people. Including relatives and supporters calling for an amnesty in support of their “oppressed community,” the number of potential proponents (read potential voters) soar. As an example, according to Legal Agenda’s assessment of Ministry of Interior numbers, there are 186,920 Sunni voters in Akkar and 285,000 Sunni voters in Tripoli Miniyeh-Danniyeh districts. Local activists report there is strong support for the amnesty in both areas. It is exactly in these districts where elites are facing electoral competition. Absent other objective barometers, the 2016 municipal elections revealed several new political trends. Results showed an erosion of support for Sunni Prime Minister Saad al Hariri’s and his Future Movement party amid a rise of adversaries to his right, such as Former Justice Minister Ashraf Rifi, who is trying to capitalize on Sunni discontent to make electoral gains in Tripoli. Rifi also publicly called for the passage of the general amnesty law. Despite expressing similar grievances in support of the amnesty law, the three communities remain divided along sectarian lines and rarely coordinate. Many viewed the others with suspicion or as not worthy of an amnesty. In sectarian systems, where spoils of the system are often viewed as zero-sum game, fear that one group would be granted amnesty at the expense of their own is palpable. Indeed several Shia interviewees recalled the 2005 amnesty which amnestied Christian Lebanese Forces Party Leader Samir Geagea and two Salafi Sunni groups involved in clashes with security forces, noting that their community saw no benefit from that amnesty. “We deserve the amnesty this time around, it’s our turn, not theirs,” one mother of a detainee from Baalbek told me. Some Shia interviewees painted the Islamists as anti-army terrorists but their own as mostly innocent victims of an unfair system that provides them neither justice nor economic respite. One mother who lost a son in the battle against extremist Sunni groups in the north-eastern town of Arsal rejected potential plans to join Islamist mothers in amnesty protests saying she can’t coordinate with groups who may have supported extremist groups who killed her son, underscoring the sometimes deadly manifestation of sectarian divisions. For their part, some Sunni Islamist interviewees saw the Shia detainees as immoral drug lords but their own as innocent victims of an unfair justice system in a region increasingly marginalizing Sunnis. Both generally saw the Christians as “Zionist traitors.” In contrast, a Christian lawyer representing the SLA families lamented that his clients endured punishment for crimes they didn’t even commit during their childhood. Most saw fault in others but shrugged off suggestions that most members of their own community bare responsibility for crimes committed. One Lebanese legal expert remarked that such sentiments surrounding the “amnesty charade” revealed immaturity on the part of the government, political parties, and the people for not taking responsibility for their own actions. Indeed, when news surfaced that the amnesty might not be passed, it was usually the other sects leaders who are to blame. When news is positive, it was attributed to their own sectarian leader. Although when pressed, they tend to admit all are to blame. Sectarian elites generally maintain power by presenting themselves as gatekeepers for justice and services for their sect. Constituents therefore look to political leaders, not the system, to solve their problems. According to a survey conducted by Lebanese Adyan Foundation 73.7% of young voter respondents considered Lebanese voters to be sectarian in general in their voting habits and that is a strong link between political parties and sectarian realities. Still several women from both communities expressed solidary with each other, noting they suffered from the same system. One mother from Hermel expressed sympathy with the mothers of Islamist detainees but worried how public coordination with other groups during protests may appear. “What if someone chants something against the Saed? 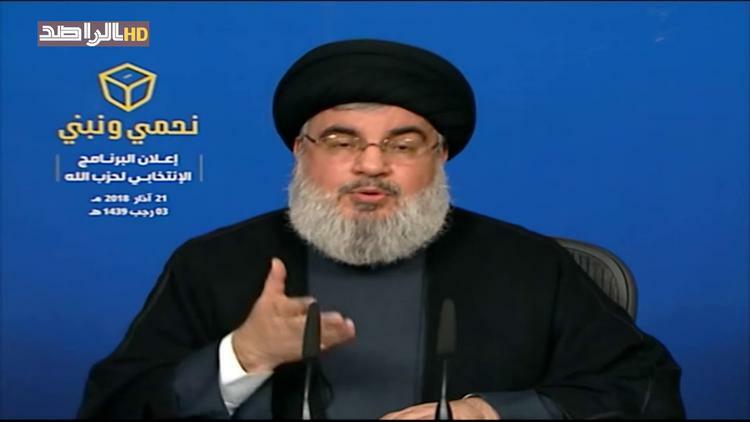 (Hezbollah Secretary General Hassan Nasrallah) This could be an issue,” she said indirectly implying that this may cause tensions with her community if she joined in such protests. But communal and sectarian ties are a means for self-assertion, security, and self-preservation, and some say they have no other choice to support their leaders. They see the fate of their leaders directly tied to their access to services as a community. “I’m not happy with the situation but I can’t not vote even though I’m upset there hasn’t been an amnesty yet. We (Hezbollah supporters) are being attacked from all angles by candidates in other districts. We need to stand up for ourselves and vote,” one woman from Baalbek said. One Sunni activist from Saida promised to support Hariri even though he thinks the amnesty won’t happen before the elections. He alleged that a former head of the Internal Security Forces was “responsible for past detainee abuses. Why would I think he cares now about detainees? Hariri and the Future Movement faced losses in 2016 municipal elections and we need to help him now,” he said. Not everyone wants an amnesty law. In fact, some are ardently opposed. The Lebanese government previously passed other amnesties including in 1958, 1967, 1991, and 2005. Indeed, elections and new political phases are often accompanied by calls for a new amnesty. The most notorious is the 1991 General Amnesty law which granted militia leaders and their members immunity from war crimes following the end of the civil war in 1989 with the signature of the Taif Agreement peace deal. Some warlords turned politicians are still serving in government today. The 1991 amnesty is viewed by many as having a detrimental impact in addressing the legacy of past conflict. During interviews several Lebanese civil society leaders and human rights activists therefore rejected the amnesty. While some sympathized with detainees’ grievances, they ultimately view a potential amnesty as further entrenching Lebanon’s impunity problem and undermining judicial authority and the rule of law. Most saw retrials as the preferred solution. Some denounced politicians’ efforts to support the amnesty as an abuse of power ahead of the elections. Others countered that an overly broad amnesty could result in the release of dangerous criminals who’ve committed serious crimes such as murder and kidnapping. Family members of slain Lebanese soldiers in particular have spoken out against the amnesty. Still others cautioned that the solution is not so black and white. One international legal expert warned that amnesties are often misunderstood, even by civil society groups. Although determination of an amnesty’s acceptability is not possible before accessing a copy of its text, people shouldn’t be so quick to rule them out. The 2013 Belfast Guidelines on Amnesty and Accountability offer guidelines for amnesty standards and acceptability including standards of exceptional nature, legal justification and benefits, and managing its broadness and vagueness. For example, in particular situations corrective amnesties releasing offenders to avoid furthering burdening an already overwhelmed judicial system may be acceptable. One Lebanese legal expert denounced what he called some civil society activists’ blind idealism. He noted that the system doesn’t have the capacity, for example, to retry thousands of detainees held on minor drug charges and suffering under terrible conditions of confinement while rubbing shoulders with hardened criminals. Saying that prisons hardly play the rehabilitative role they claim to have anyway he urged for the passage of a limited amnesty for less serious crimes on humanitarian grounds. Indeed another Lebanese lawyer representing detainees from the Biqaa noted that the intense overcrowding in prisons and snail-paced processing of some files alone gives support to pro-amnesty voices. Moreover, the Lebanese penal code already provides for the issuance of general amnesties, so why not use it? He argued in favor of the amnesty law as a basis from which to relaunch advocacy efforts to address systemic failures in the criminal justice system. Despite cause for pessimism, the proportional electoral law is untested, new terrain. Independent lists and candidates are hoping to breathe new life into the system. Shifting traditional political alliances have led to unexpected shake-ups with some parties competing against each other in one district and together in another. In this new electoral environment, candidates are negotiating district by district, putting more of an emphasis on lists than party loyalties, resulting in a campaign driven by electoral gains rather than campaign alliances. How this plays out in the post-election environment remains to be seen. Still, elites are keen on saving the system and want to squash any counternarratives that may destabilize their power in government. And the international community isn’t protesting, reportedly prioritizing stability above all else. A Lebanese political and electoral analyst warned that even if independent candidates get elected, the weight of the confessional system will prove too much to bear and they will be forced to align with traditional parties or be pushed out. Others are not so pessimistic saying that shifting realities on the ground are making way for new members and rules in the government, even if not in this election, but for the next. On April 16 Justice Minister Jreissati and Parliament Speaker Berri indicated that the amnesty law will only pass after political consensus is reached following the elections. Candidates who promised its’ passage before the elections may suffer at the ballot box. As some of the most vocal champions of the general amnesty law, this could negatively affect Hariri and the Future Movement the most. Despite today’s news, activists and detainees’ family members continue to anxiously scan social media, hoping that tomorrow’s news may reverse today’s as it often does in Lebanon. Many remain pessimistic but hope that just for once, the elites will prove them wrong.